A scary eye spot adorns the wing of an owl butterfly. 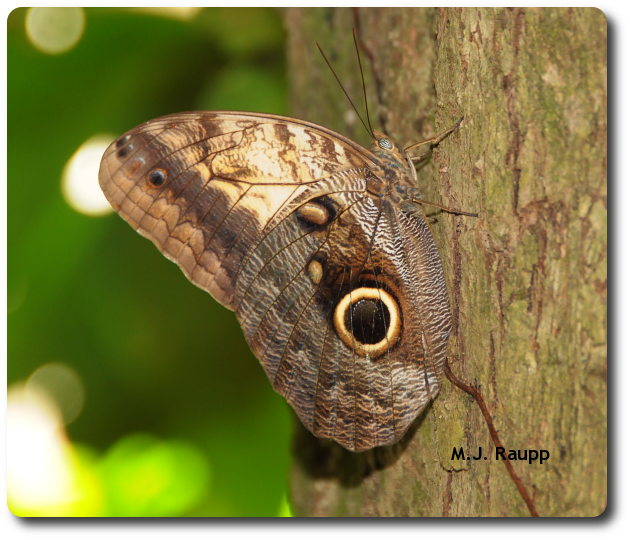 The trees have eyes - Owl butterflies, Caligo sp. The last time we visited the rainforest of Belize we met the cryptic lantern fly and learned its clever “flash and disappear” strategy for survival. This small tree bears two widely separated eyes. While photographing some stingless bees visiting a flower, I glanced to a nearby tree and was surprised to see the tree staring back at me. A closer inspection of the tree revealed a large owl butterfly. These beauties have evolved a clever strategy for dealing with would be predators. Intricate patterns of scales on the underside of their hindwings create an illusion of a large staring vertebrate eye complete with pupal and iris. Orlando wrangles a handful of gorgeous owl caterpillars. It is thought that this large eyespot is used by the butterfly to startle or otherwise confuse hungry predators such as birds or lizards. Studies have shown that the more closely the pattern resembles an eye the more likely a predator is to be deterred by the ruse. Another theory suggests that the false eyespot may draw the attack of a predator away from a vital body part such as head or abdomen to a less vital area such as the end of a wing. Dead leaf of reptile head? Only the butterfly and its predators know for certain. Caterpillars of the owl butterfly are similarly impressive creatures. By some strange good fortune we stumbled upon a butterfly house at a jungle resort and visited a large collection of owl butterfly larvae. These remarkable creatures have conspicuous forked tails and resemble tiny snakes or perhaps large slugs. In their native habitat they consume leaves of heliconia, banana, and some palms. The pupal case or chrysalis of the owl butterfly is brown and dappled with two small golden spots on the sides near the head. A small horn adorns the top. While some books report the chrysalis to resemble a dead leaf, a Belizean caterpillar wrangler assured me that the chrysalis was a dead wringer for a local hognosed snake. This surely would give a hungry bird or lizard reason to pause. Bug of the Week thanks Orlando for teaching us the ways of the owl butterfly caterpillar and its chrysalis. James Castner’s “Amazon Insects” and Penny Gullan’s and Paul Cranston’s “The Insects” were used as references for this episode.